Quantity Discount Packages are Not Eligible for Bonus Bucks or Vet Discounts. 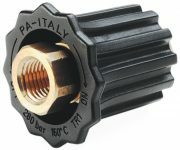 Install 1/4″ high pressure nozzle. The purpose of a nozzle holder is to make it possible to get low-pressure chemical application and high-pressure spray at the gun with a single lance. There are several difference designs to consider. Using a nozzle holder instead of a dual lance has many advantages. Single lances are available in almost any length. 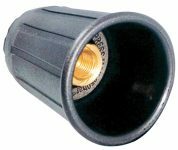 If a custom length is desired, it is easy to cut and thread the pipe. Dual lances are available in only a limited number a lengths. Dual lances are heavier that a single lance, and also cost more. These factors make a single lance equipped with a nozzle holder desirable. This nozzle holder has two ports. Into one port a threaded high-pressure nozzle in installed. The other port has a low-pressure chemical nozzle. Inside the nozzle holder there are seats for each of the two nozzle ports, and a ball that floats back and forth between them when there is no water flow. This ball is pushed and locked in place when the trigger gun is opened. 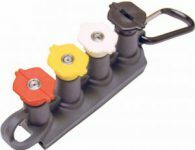 This nozzle holder withstands abuse, such as dropping on the ground, very well. It requires some practice to get used to how best to make it work. Some people stop spraying and shake the unit to change the position of the ball. Others develop a method that involves tapping the lance on their upper leg to accomplish the same thing. This unit works well in most any application. The biggest complaint given about this nozzle holder is that the ball sticks when it is used with a trigger gun that leaks. If the trigger gun leaks badly enough, the nozzle holder ball will get locked down on the seat and you won’t be able to get it to change. 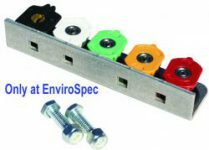 This nozzle holder is our most popular. Simply install a high pressure nozzle in-line with the lance and a low pressure soap nozzle in line with the ‘trombone slide.’ Pull ‘slide’ back for soap and push it forward for high pressure. Watch this short video and you will see why it is so popular. 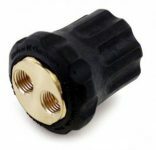 This nozzle holder is also referred to as a rosebud nozzle holder. 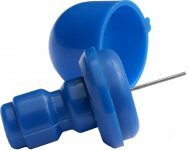 It holds one threaded spray nozzle in a center-threaded port. 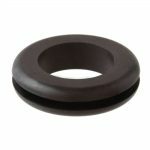 When the operator wants to change to low-pressure chemical application, the outer plastic ring is rotated. This causes the water flow to be diverted away from the nozzle in the center port. The water comes out in a shower pattern that encircles the center port. The pattern is just like a shower head pattern found in a regular shower. The pressure is lowered substantially resulting in excellent chemical draw. 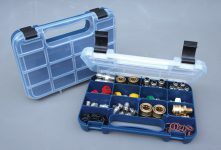 This nozzle holder is extremely durable. It is best used for flat surface cleaning, or any other application where a fan pattern doesn’t aid in the chemical coverage. In applications such as truck washing or house washing, a fan pattern speeds chemical application. 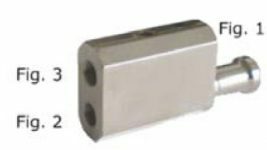 The shower type nozzle holder doesn’t apply chemical as efficiently in most vertical applications as other nozzle holders that utilize an actual chemical nozzle. The twist type nozzle holder has a 45-degree block on the bottom, into which the lance is screwed. The other side of the block has a hollow post that holds a swivel head unit. The 45-degree block is attached to the lance so that the head unit extends up from the lance. The head unit has two nozzle ports. 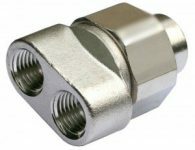 One port holds a high-pressure nozzle and the other holds a chemical nozzle. Whichever nozzle is pointing away from the operator is the nozzle the water comes out of when spraying. A dot that is located on the very top also indicates which nozzle the water is directed into. Changing from low to high-pressure operation, or visa-versa is accomplished by releasing the trigger gun and turning the nozzle holder head one half a turn. The biggest draw back to this nozzle holder is the hub. It is a weak spot. As long as the operator understands that the hub can’t be abused, this is a great nozzle holder. First, when tightening the unit to a lance, and installing the nozzles, it is important to counter the tightening toque so force is not applied to the hub. When in use, care must be taken not to throw the gun to the ground, because sooner or later the nozzle holder head will be broken off of the hub.